The fast pace of the technology is evolving every year and at speed which is beyond any imagination. The risk and cost of delivering higher quality in production is augmenting every day. The emergence of embedded systems has cut down the cost and risk while has increased the quality too. Such systems can be referred as computer systems which are embedded in mechanical or electrical systems. The real time embedded systems tend to be very helpful for controlling and monitoring the external environments. The usage of such systems has practically improved over the last few years and this has widely been used in commercial industries, robotics, aeronautics, military, telecom, kitchen appliance and automobile industries. ICSIT Chandigarh provides the perfect embedded systems training in Chandigarh. The training company has experienced specialists that impart knowledge and improve your skills, thereby preparing you for a much bright future. They guide you on different industry functions and also provide knowledge that help you start a career in the right direction. Every candidate benefits from our relationship that we have with different people and companies in the IT industries. 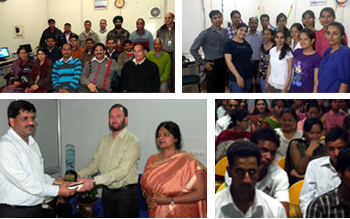 Our training is so rich and comprehensive that it brings in positive results in the students. Our main objective is to keep the training program updated with current technology. ICSIT Chandigarh is one of the best training companies in Chandigarh that is well reputed and renowned that ranks high not only in the tri city but also in India.